The family of Waleed Riyad ad-Daly, 14, held by Israel in Ofer prison, voiced an appeal to various human rights and legal groups, calling for the release of their detained child, who was also injured in his arm when the soldiers abducted him along with two other children, in late September 2017. 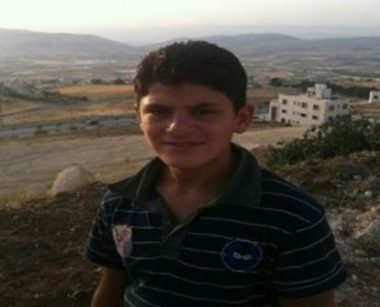 The child’s father, Riyad ad-Daly, said that the soldiers shot his boy in his arm, after they and undercover officers invaded Biddu village, northwest of occupied Jerusalem, before shooting and violently assaulting the child, and abducted him along with two other children, identified as Yazid Akram Hmeidan, 15, and Hamada Jamal Abu ‘Eid, 16. He added that his child is now the youngest detainee in Israeli prison, and is in urgent need for specialized medical treatment, and added that Jamal was sent to court 13 times since then; each time the judges extended his detention. Jamal, along with Yazid and Hamada, are accused of throwing stones at the army’s jeeps, after the soldiers invaded their town. It is worth mentioning that the Palestinian Prisoners’ Society (PPS), the al-Mezan Center for Human Rights, Ad-Dameer Prisoner Support and Human Rights Association, and the Palestinian Detainees’ Committee, have recently stated that the Israeli army abducted 431 Palestinians, including 98 children, this past September.